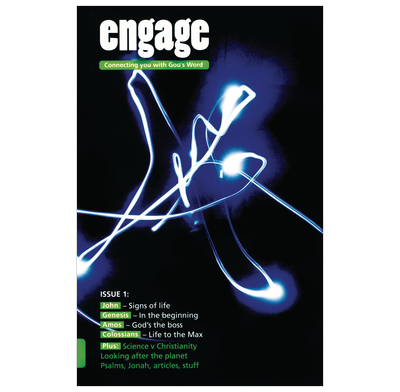 This edition of Engage looks at Psalms, John, Genesis, Amos, Colossians and Jonah. The first issue of Engage - daily Bible reading notes for teenagers. This issue looks at Psalms, John, Genesis, Amos, Colossians and Jonah! It also examines questions like 'has Science disproved Christianity? ', 'what's the bible anyway?' and contains articles on the Trinity and looking after the planet. Toolbox: What is the Bible anyway? Tricky: Has science disproved Christianty? Essential: The Trinity: An inconvenient truth? I read this every night with my 12 yr old daughter. I find she is interested and engaged and it is written in a way that is easy to understand. I am very happy with it. I bought this book at my church and it's been really useful for me (a fourteen year old) to make bible study fun, accessible and something to look forward to. I feel like I can now really apply scripture to my daily life, and like this in depth look at scripture is really helping to strengthen my relationship with God. I bought this book at my church and it's been really useful for me to make bible study fun, accessible and something to look forward to. I feel like I can now really apply scripture to my daily life, and like this in depth look at scripture is really helping to strengthen my relationship with God.